TWEET TWEET!!! 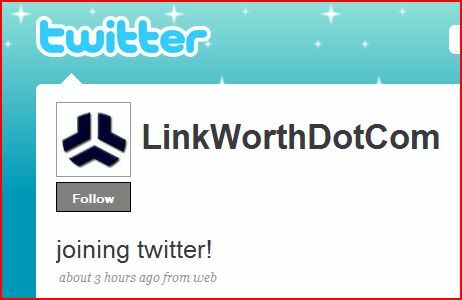 No, that’s not a bird you hear, those tweets are from the new LinkWorth’s Twitter Profile. While most have probably heard a lot of buzz about the up and coming micro-blogging service Twitter, there are many who still may be in the dark so let us briefly explain what Twitter is. According to Wikipedia, “Twitter is a free social networking and micro-blogging service that allows its users to send and read other users’ updates (otherwise known as tweets), which are text-based posts of up to 140 characters in length.” Basically Twitter is a whole social network devoted short little messages, I like to think of it as the evolution of the Instant Messenger “away message” from online days of yore (back when AIM was king). So why has LinkWorth joined Twitter? In the long term Twitter could very well become a useful way of communicating with our users, but right now the whole reason for the LinkWorth Twitter Profile is to provide real time updates on our trip to the 2008 PubCon Search Marketing Conference in Las Vegas Nevada, November 11th – 14th. We’ll be “tweeting” all the latest search news from PubCon, as well as documenting our teams shenanigans out on the town! What happens to us in Vegas, probably will stay in Vegas… but everything that doesn’t will end up on the LinkWorth Twitter Profile. Be sure to check it out November 11th – 14th. Previous PostPrevious PubCon Around The Corner – Tattoo Anyone?